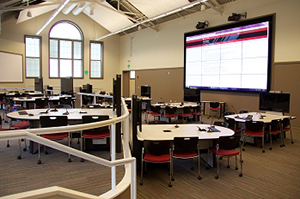 The university, which has eight sites around the state, has set up multiple active learning spaces at the main campus in Bloomington, where it will also kick off a major instructor training program. By the 2016-2017 academic year, IU expects to roll out comparable opportunities at the other campuses. Active learning immerses classes into highly modular spaces where students can form themselves into groups for team activities. Currently, the Bloomington campus already has several such spaces, including the "Collaborative Learning Studio," the "Collaboration Café" and several classrooms inside a new Global International Studies Building. However, additional active learning spaces will be added as part of the Mosaic work. Most of those classrooms put an emphasis on "mobile" — deploying portable whiteboards, wireless projectors, movable furniture and other technologies that help facilitate student collaboration. Access to other faculty who are exploring similar instructional approaches and research projects. One pioneering faculty member said the active learning environment appears to create a better learning experience for students. "I find students respond better to active learning and I've tried to integrate it into all my classes. There is strong, conclusive literature that supports the effectiveness of the technique," said John Duncan, a lecturer in the School of Informatics and Computing who has taught classes in the Collaborative Learning Studio. "The Mosaic approach is so innovative because it recognizes the value of active learning spaces to all disciplines, as well as the unique needs and challenges of each individual discipline," said Provost and Executive Vice President Lauren Robel, in a press release. "We are excited to see the rich variety of collaborative learning spaces that will be created all across the Bloomington campus for the benefit of our students and faculty."